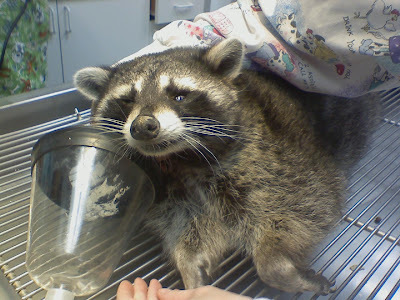 Here is our raccoon patient from last week. It was so interesting to have something different come into the clinic. He weighed 27 pounds. That's about 15 pounds too much. What is wrong with the racoon other than being overweight? I didn't know there was racoon food! I think I fed mine catfood, if I recall correctly. Anyway, whatever I fed him, he lived with me for 8 years with no problems. AWWW-what a sweet patient who has been told to loose weight. He is so cute! Now onto his favorite snack-frito with butter-gross! Seriously, I can't believe it's not butter on a frito?!? No wonder he's chunky! So this raccoon was someone's pet? If so I have never heard of that. I thought they were really mean. Hilarious! You know I am totally envious of your job right about now. How fun to have a raccoon in! When are you going to start writing some books?? I'd buy the first copy! That is hilarious, I can't believe she admitted to feeding him that. I can't believe there is "racoon food" either. How fun!